So often we focus on the losses in adoption. We hone in on the negative. The horror stories are the ones that make the news. We hear the negative, feel it and absorb it into our beings and wear loss like a blanket. But sometimes... sometimes the miracles are so big you just have to stand back and look at those miracles square in the eye and just marvel at them. 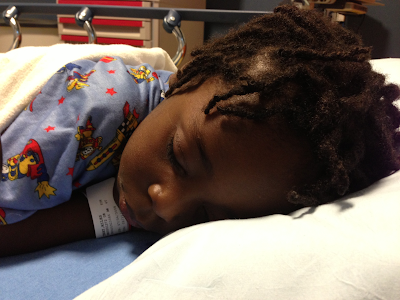 Yesterday, Miles spent almost 8 hours in the emergency room. He had localized, horrible pain in his abdomen that was so bad he couldn't walk or talk or stand up. Our doctor was just certain that he had appendicitis, so he sent us to the hospital. Miles had a battery of tests and scans after a long time, the ER doc said he was in the clear and some IV fluids and graham crackers should bring him back to life. He's doing so much better today. While Miles was laying in his hospital bed sleeping, I couldn't help but turn to Kamron and say, "You know, if he'd been in an orphanage and his appendix ruptured, he would have died." We know the statistics. 20% of kids in Congo die before they ever get the privilege of turning 5 years old. Hundreds of thousands of kids all over the world die every year of preventable diseases. And sometimes (let's face it- all the time) those statistics are mind numbing. But THIS CHILD... oh MY precious child could have been that statistic so many times over. As I look back nearly 3 years and see that tiny, almost 2 year old boy who was the size of an American 5 month old, with a body full of parasites, I get shocked that he made it at all. Extreme malnutrition is a slow and painful death and the fact that this ONE fought and lived until we could get to him when so many other children in the same circumstances didn't make it... MIRACLE. I thought back to Miles' first visit with the eye doctor where we learned that the specific condition of his eyes was so severe that, if left untreated, would cause him to lose his vision and possibly go blind. 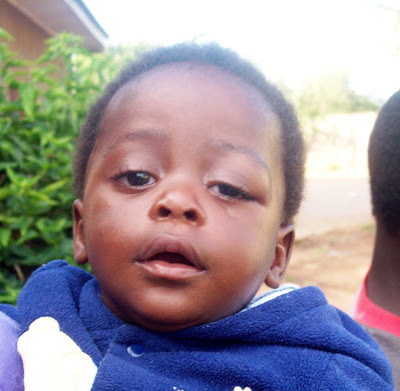 I couldn't help but picture him blind on the streets in Lubumbashi, Congo with no one to care for him. The fact that we live 20 minutes from one of the top pediatric eye doctors in the country and that Miles can see so well now? MIRACLE. I thought back to the whole first year he was home and how we fought to restore the hearing that he'd lost (almost 70% hearing loss in one of his ears and 50% in the other) from what his doctor said was likely two years of untreated infection in his ears. Everything sounded like he was under water. He still has some hearing loss, even after years of top notch medical care and two surgeries. But without it? Do you think the child without hearing is well taken care of in an orphanage where special needs are nothing but a drain on resources? It hurts to think that that would have been MY child. The fact that he's here and repeats every single thing he hears? MIRACLE.